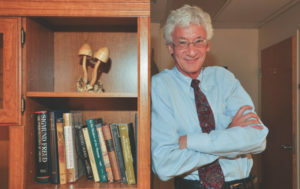 Roland Griffiths, professor of psychiatry and neurosciences at Johns Hopkins University, is one of the world’s leading researchers investigating magic mushrooms’ eye-opening impact on everything from depression to anxiety to nicotine addiction to end-of-life distress. Johns Hopkins, University College (London) and NYU are the leaders now researching the wide-ranging effect of psilocybin, and a raft of studies show its positive impact on alcohol and nicotine addiction, OCD, depression, anxiety, and as powerful treatment for those facing end of life. What these conditions have in common, researchers argue, is that brain circuitry may have become “stamped in,” and what they’re finding is that a single dose of magic mushrooms seems to uniquely reset the brain…and not just during a trip, but for months. Using brain-scanning tools (like fMRI) they’re discovering what happens to the brain on psilocybin. First, parts of the brain that are typically hyperactive (the ego or “orchestrating centers” that, say, make you worry) shut down. At the same time, other brain regions that normally don’t communicate suddenly strike up conversations, eliciting new emotions, memories, wishes, etc. – essentially returning us to the state of a child (or long-term meditator). Which is why people report such a sense of connection with the world and other people and a new ability to see the “big picture.” And psychedelics knock down old brain patterns and jumpstart new ones by acting on the too-little-studied serotonin 2A receptor (while commonly prescribed SSRIs only activate the serotonin 1A receptor). As lead researcher Dr. Robin Carhart-Harris at Imperial College put it, magic mushrooms essentially “shake the snow globe” and benefit people that suffer from disorders involving excessively rigid patterns of thinking – as well as unlocking creativity. Depression: A headline-grabbing 2017 Imperial College study revealed clear changes in brain activity and significantly reduced symptoms for treatment-resistant depressives lasting weeks after a single dosage. The findings proved so exciting that the researchers are undertaking more robust studies testing psilocybin against a leading antidepressant in 2018. Addiction: Studies reveal brain-resetting psilocybin’s impact on various addictions. One small study showed that after two psilocybin treatments 80% of long-term heavy smokers had still quit six months later, while another indicated that a couple of mushroom doses had a significant effect on reducing drinking at eight months for the alcohol-dependent. 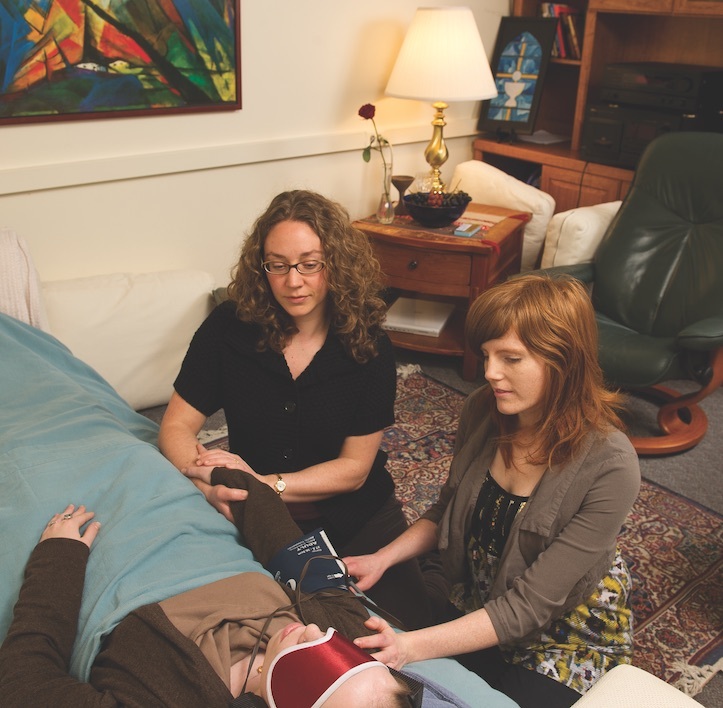 Deepening Spiritual Life: Because mystical experiences are at the heart of most religions (Moses saw that burning bush…), NYU and Johns Hopkins are now studying clergy to investigate the neurobiology of both mushroom and religious experiences. And while the study isn’t yet published, the researchers report very similar brain states with a psilocybin dose and what religious leaders have experienced at meditation retreats. Improving Personality: While research has long indicated that after age 30 your personality is pretty much a done deal, studies show that a single psilocybin dose has a positive, maybe even permanent, effect on people’s personalities: making them more open-hearted, creative and curious. This new evidence is so unexpected that a year ago, nearly the entire issue of the Journal of Psychopharmacology was devoted to the impact of magic mushrooms (14 studies). Because many studies are small (true for most wellness studies that aren’t funded by the deep pockets of Big Pharma), the familiar chant is “more, larger, high quality studies are needed.” Agreed. But as Professor Craig Blinderman of Columbia University noted in his commentary in the Journal of Psychopharmacology, “If these findings are confirmed in large randomized controlled studies…the classification of psilocybin as a Schedule 1 drug should be challenged, for this would represent a treatment unlike anything in psychiatry: a rapid sustained reduction in depression and anxiety with a single dose of a psychoactive compound.” Professors at Ivy League universities don’t often fling these kinds of statements around. The pace of research is seriously quickening in 2018, and it’s the research that will determine whether laws banning their use – and consumer attitudes – get a reset. Psilocybin sessions, which are about 7 hours in duration are conducted in living-room-like session rooms at Johns Hopkins. Participants are carefully screened and spend several hours with clinical staff in preparation for the session. During psilocybin sessions, participants are encouraged to lay on a couch, use eyeshades and headphones through which supportive music is played. Two trained session monitors are present throughout to provide social support if needed. 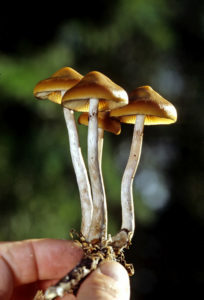 Chemically pure psilocybin is administered in a capsule the morning of the session. The 2017 Global Drug Survey (examining data from over 50 countries) concluded that magic mushrooms are the safest recreational drug in the world: dramatically less likely to require post-usage medical treatment than alcohol, LSD, cocaine or opioids like OxyContin. Studies also show that there are no significant abuse concerns: they’re non-addictive and non-toxic to the body’s organs. And while psilocybin’s effects are similar to LSD, it’s less strong and long lasting, and doesn’t carry the negative cultural baggage. And crucial to many wellness consumers: They’re natural, rather than concocted in a lab. However, very few would argue that this should be seen as license to “try a pile of shrooms at home” as the positive effects in clinical trials have much to do with correct dosage, setting and supervision. The legal status of magic mushrooms varies complexly worldwide. The UN categorizes them as Schedule 1 drugs, so most countries regulate or prohibit them – but with much selective enforcement. However, they’re legal in countries like Spain, the Czech Republic, Jamaica, Costa Rica and Austria; and while technically illegal in the Netherlands, a loophole means the sale of “magic truffles” is rampant. Some interesting legalization action is now underway: a measure to decriminalize them in California has cleared the first hurdle for the ballot in 2018, and there is a push to put them on the Oregon ballot in 2020 (for use in organized clinics, not at home). We know that with cannabis legalization where California went, so went much of the U.S. And when you wrap your mind around how fast and radically laws and attitudes toward cannabis have recently changed, you can see how a safe, evidence-backed psychoactive like magic mushrooms might soon see a similar legal and mindset shift. Microdosing psilocybin (and other psychedelics) means taking very small amounts (maybe 1/10th of a dose) every few days over several months. It doesn’t cause a consciousness-altering trip, but is designed to be large enough to affect thinking, creativity, problem solving, connection to others, and anxiety. It’s all about cognitive enhancement – a biohacking of the brain – so it’s no surprise it was pioneered among Silicon Valley professionals, whether engineers or artists. Popularized by Ayelet Waldman’s 2017 book A Really Good Day, microdosing is now spreading around the world, attracting white-collar professional experimenters far beyond some “druggie” fringe. YouTube tutorials and Reddit groups on how to microdose mushrooms are spawning. Tech entrepreneur, Paul Austin, a professional microdosing coach, offers Skype consulting sessions and an online course through his website The Third Wave – and is building a Microdosing App that will track people’s progress and experiences. And if no formal studies have analyzed the science behind microdosing, that will change in 2018 as UK-based nonprofit the Beckley Foundation undertakes the first research. It’s striking that when a psychiatrist like Julie Holland imagines the future of psychedelic experiences she envisions a place that’s “a cross between a spa/retreat and a gym…where they can be experienced in a safe, supportive environment.” And it’s a fitting model: an expert-led, sensory-focused retreat where a psychedelic “trip” happens within a wellness trip (as psilocybin, unlike cannabis, is hardly an everyday drug). 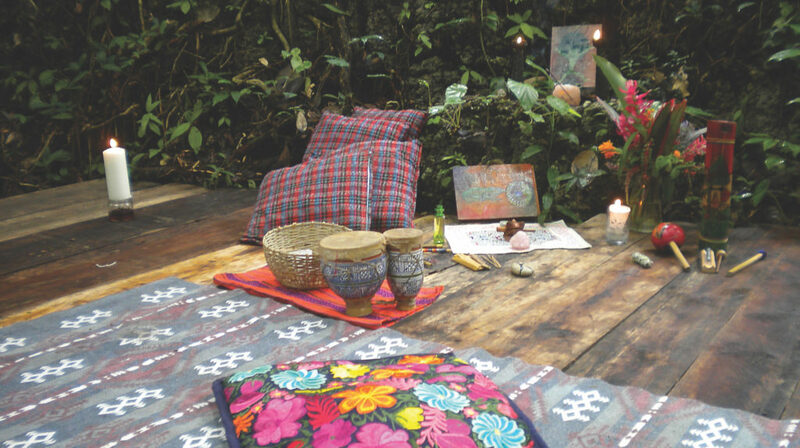 We’ve had ayahusaca retreats in South America for years (and the media had delighted in chronicling these spiritual journeys favored by the hip and famous). But now all-inclusive magic mushroom retreats in countries where psilocybin is legal (like Jamaica, Costa Rica and Holland) are on the march and quickly getting more luxe. 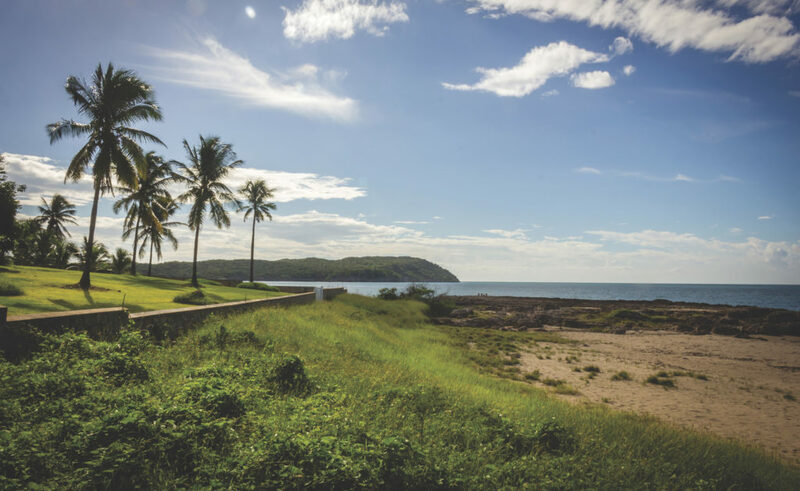 MycoMeditations is a pioneer with weeklong retreats on a private Jamaican bay, with airport pickup, lovely food, guided hikes and massages, and evening by-the-fire-and-ocean group mushroom sessions. Last month MycoMeditations’ founder and comedian Shane Mauss teamed up for a luxury mushroom retreat on the island. The exclusive Alquimia Centre of Healing Arts in the Colombian jungle (that accepts guests who receive one of their much-sought internships) serves up serious education on Amazonian medicine and enlightenment through expert-led natural psychedelic experiences like magic mushrooms. Paul Austin’s The Third Wave has begun full-blown magic mushroom retreats in Costa Rica, the British Virgin Islands, Jamaica and the Netherlands. Sites like OpenMindTrips.com aggregate psychedelic and mushroom retreats worldwide, and while there are far more heavier-dose ayahuasca retreats now, mushroom retreats are popping up everywhere from Ibiza to Bali. It’s not “high” on every traveler’s bucket list, but in an age where “the trippier the better” rules in wellness travel (we seek everything from shamans to crystal healing) mushroom retreat offerings will only evolve and expand. 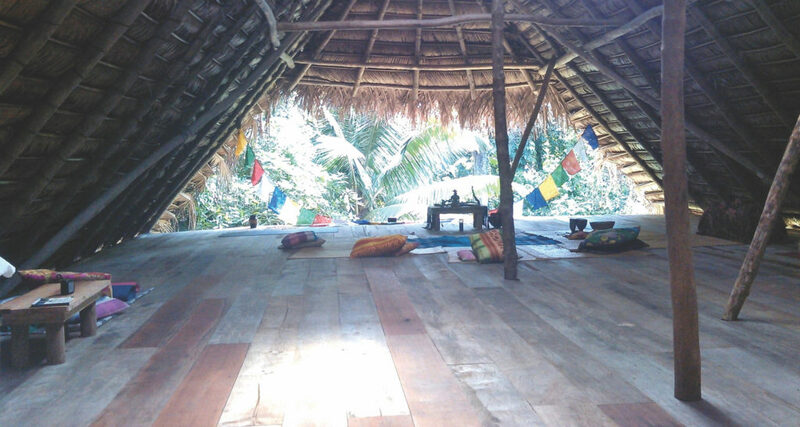 Alquimia Centre of Healing Arts in the Colombian jungle serves up serious education on Amazonian medicine through expert-led natural psychedelic experiences including magic mushrooms. The remarkable qualities of different mushroom varieties would be impossible to chronicle here: mushrooms contain polysaccharides and beta-glucans that jumpstart the immune system; they’re a massive natural source of Vitamin D; they stabilize blood sugar and fight inflammation. And some varietals, like reishi, cordyceps, chaga, lion’s mane and maitake, are adaptogens (a concept buzzed about in earlier trends reports), which means that they have a unique power to help our bodies resist the biological, chemical and emotional stressors that attack us every single day. And it’s not just supermarket, but also beauty aisles, that are experiencing a great mushroom invasion. They’ve long been a key component in Asian beauty products and now mushrooms are hitting global skincare, cosmetic and haircare lines for their unique powers: as super-hydrators, antioxidants that repair skin cells, collagen boosters and skin tone eveners. New processes make it much easier to extract the active nutrients in mushrooms so they can be snuck into tonics, powders, bottled drinks, snack bars, chocolates, coffees, cocoas, teas, broths and oils. Yes, they’re trendy: you can grab a mushroom latte from Melbourne to Miami. And we join other trends forecasters in spotlighting mushrooms as a fast-moving functional food and beauty ingredient (Whole Foods named them a top-ten food trend for 2018, MindBodyGreen for 2017). What’s important is that this rediscovery of mushrooms-as-medicine is not only trendy…it has the virtue of being backed by evidence. Mushrooms are at the root of many modern pharmaceuticals, from penicillin (which has saved more human lives than any medication) to anticancer drugs. And evidence for their body and brain benefits just keeps mounting. 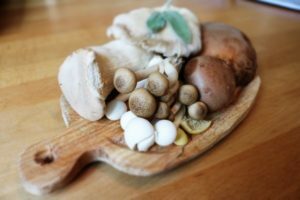 Example: A new Penn State University study reveals that all mushrooms (but especially delicious wild ceps or porcini) are the #1 source of two important anti-aging antioxidants, ergothioneine and glutathione, that protect the body against cancer, coronary heart disease and Alzheimer’s disease, while keeping the brain healthy. Researchers speculate that that’s why countries like Italy and France (who eat more mushrooms) have much lower rates of neurodegenerative diseases like Alzheimer’s and Parkinson’s than countries like the U.S. Hitting Italian levels isn’t hard: just 5 button mushrooms a day. While mushrooms aren’t “plants” they’re benefitting from one of the biggest global wellness trends: more people moving to less- or no-meat diets. Consider: The number of vegans in the UK skyrocketed 350% in the last decade, and 42% are aged 15-34. In the U.S., veganism jumped 500% since 2014. Companies are busy developing technologies that infuse more mushroom-medicine into foods. M&S has developed Ireland-grown Active Health mushrooms with a 100% daily dose of Vitamin D and vitamin B5 to fight fatigue. MycoTechnology’s new vegan mushroom protein PureTaste has raised $35 million in funding (and a big investment from Kellogg) – a clear sign that innovating mushroom infusion into foods is going mainstream. The nutritionally complete food brand Soylent has launched Coffiest (a caffeinated alternative for the breakfast skipper) packed with vitamins and L-theanine, a stress-relieving, brain-enhancing nootropic derived from mushrooms. 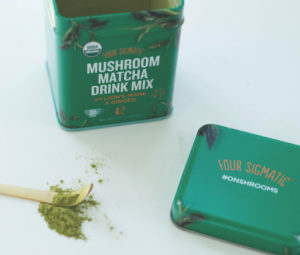 Mushrooms – especially the stress-effect-fighting adaptogenic breeds like reishi, cordyceps, chaga and maitake – are being infused and brewed into everything imaginable. Mushroom-mad company Four Sigmatic (brainchild of a Finnish chemist) serves up a whole range of adaptogenic mushroom-packed coffees and hot chocolates. Gaia Herbs recently rolled out a whole line of mushroom supplements targeting everything from brain to liver health. Mushrooms are the star ingredients in Choice Organic Teas’ Wellness Teas collection. And before you say “blech,” companies are working overtime to make them delicious. Rebbl’s reishi chocolate milk blends up cocoa and coconut milk with reishi, while Love Grace’s new mocha drink whips up adapatogenic mushrooms with cold-brewed coffee, coconut milk, cacao and cinnamon. And yes, there’s chocolate: both Freaky and Wild Alaska chocolate brands are infusing a host of healing mushrooms. Many mushrooms are skin and hair superfoods so they’re on the serious rise in beauty products. Chaga mushroom is a natural antioxidant and anti-irritant with zinc and melanin that helps repair skin cells and eliminates free radicals that cause wrinkles; Chinese cordyceps is known for creating cellular energy necessary for the skin’s protective barrier; tremella mushrooms are prized for their antioxidant and deep hydrating benefits. Mushrooms are skin superfoods and are blooming in beauty products – like Dr. Andrew Weil for Origins Mega Mushroom Collection, blending supershrooms like chaga and reishi. Too many products to name: Dr. Andrew Weil’s “Mega-Mushroom Skin Relief Collection” blends chaga, reishi and more. Korean beauty companies have been pioneers in the use of mushrooms as a skin elixir, and tremella extract is found in K-beauty brands like Earth’s Recipe lotions and potions. Makeup artist Charlotte Tilbury’s products use shiitake mushrooms in their ingredient “Fermiprotect” which appears in products like her Magic Foundation. Kerstin Florian’s Correcting Brightening Facial Treatment is loaded with Chinese mushrooms to attack skin inflammation and hyperpigmentation – and there is an entire “Mushroom Collection” from Prana Spaceuticals. And more hair care is mushroom-powered, like ANUVA’s Tonifying Shampoo with reishi or Beauty 4 Ashes’ Maitake Healthy Hair Growth Shampoo. Foraging is of course a buzzword in the food and hotel industry: Not only do chefs handpick wild mushrooms and herbs, now more properties let guests experience that sense of place and nature with more mushroom foraging and unique mushroom cuisine. For instance, at Emerson Resort & Spa in upstate New York, guests can opt for summer “Mushroom Walk” packages where the local “Mushroom Man” leads them in mushroom foraging while educating them about each breed’s healing powers. And at the amazing Stanford Inn (Mendocino Coast, California), the first vegan resort in North America, there’s mushroom foraging experiences and a cool, ongoing “Medicinal Mushroom Breakfast” that not only serves up mushrooms on the plate it educates diners on their medicinal impact. Mycelium, the invisible root network for mushrooms, is our Earth’s oldest and largest organism and a form of intelligence living right beneath our feet. As Louie Schwartzberg’s new documentary (in post-production) argues, far too few people comprehend mushrooms’ extraordinary potential uses because their story is just starting to get told. (Scientists estimate only 5% of the 1.5 million funghi species have been identified.) Now scientists argue that mushroom mycelium, because it’s the planet’s great decomposer (and can “munch” away hydrocarbons, oil, petroleum products, pesticides, etc. ), could prove a future super-weapon in cleaning up toxic waste and offsetting global warming. Much experimentation with mushroom wellness is underway: Designers are making eco-friendly clothing out of funghi and working on how mushrooms could create the light, biodegradable homes of the future. As the microdosing trend among creative professionals (from San Francisco to Sweden) shows, wellness seekers often take matters into their own hands. The drugs people most seek always say so much about our current culture: With so much anxiety, depression and digital overload, people desperately seek a “brain reset,” whether with shamans or sound baths. And the medical evidence indicates an actual brain reset is precisely what magic mushrooms deliver. Magic mushroom retreats, in nations where legal, will continue to pop up, and weave in more “luxury wellness.” When you think about it, while professional/clinical guidance is key, the perfect-fit environment is not a cold, scary hospital but a type of spa/wellness retreat – where caring, professional support; immersion in nature; and safety, comfort and sensory exploration is already the brand. While a very different psychoactive experience and smaller potential market, the magic mushroom trend now bears some resemblance to the early days of the now-raging cannabis-as-wellness trend. Who would have thunk even three years ago that there would now be glossy magazines devoted to the luxury “cannabis lifestyle” or that a fancy hotel like The Standard Hollywood would be putting a high-end cannabis boutique smack dab in the lobby? We’ve seen how legislation, and minds, can change lightning fast. And movement on the magic mushroom front is really quickening. Scientists at Sussex University have just created a drug-free virtual reality machine that simulates the experience of taking magic mushrooms (to understand altered states of consciousness), while a lead Johns Hopkins scientist has just released the best (science-based) playlist (think Bach, Vivaldi and Louis Armstrong’s “What a Wonderful World”…) for a mushroom trip. As the medical evidence piles up that a whole spectrum of new-to-many “regular” mushrooms are magical for health, an explosion of mushrooms (from reishi to cordyceps) will get worked into many more functional foods and drinks. Just as a new profusion of shrooms – whether antioxidant chaga or tremella – will get infused into more beauty products. We predict that mushrooms will not be a superfood du jour. Mushrooms can reset our consciousness and deliver unique medicine for our brains, body and planet. As Dr. Weil notes, “They fill niches for which we don’t have anything in western pharmacology.” We are just at the tip of the iceberg with this (far too long) underground force.